Most men crave for beards but little do they know that beard grooming don't just happen overnight, it involves a lot of task and care. One of the method of achieving properly groomed beard is by using a beard balm, and it is advisable for men to use one. Beard balm is been regarded as a styling and shaping aid for the beard. A good beard balm should be able to moisturize the facial hair, provide hold for styling of the beard and makes the beard look thicker. Most beard balms contains shea butter for soften and moisturizing, sealant (such as beeswax) for sealing in moisture and sweet almond oil for conditioning and booting growth. This ingredients helps in facilitating proper beard grooming, and when it is naturally based, it does not have any side effects on your skin or beard. 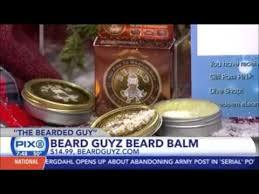 A good beard balm is normally made with blends of natural essential oils rather than synthetic ones. Synthetic fragrance oils mostly contains toxic chemicals that can normally cause irritation on your skin, and also alcohol that can leave your beard more brittle and dry at the end. It is always advisable to read the ingredients of the beard balm before purchasing it. If you noticed that you have a patchy beard, then you should consider using a beard a balm with shea butter, because shea butter is basically good at making facial hair to appear thicker. In addition to all natural sealants, you should ensure that your beard balm contains all natural moisturizers like argan or jojoba oil. Excluding this moisturizers, the sealant will just seal in dryness, making your beard soft and easily broken. A quality beard balm should contain all natural moisturizers and sealants, which will moisturize, condition and provide hold for your beard. 6. Ensure that you spread the beard balm to all the hair roots to nourish them and facilitate the healthy growth. 7. Use the boars hair brush to straighten your beard, or scrunch facial hair in fists to accentuate curl. 8. Use up to three times a day, as required. All natural beard balms containing shea butter and beeswax can be left in until you wash your beard. Beard balm containing petroleum jelly should be rinsed out rightly to avoid damage to facial hair. It is recommended to apply beard balm after washing and drying your beard. If the beard balm is applied correctly and regularly, it will keep your beard healthy, strong, shiny and help you groom that long full beard you have ever wanted.